Here’s another breakdown of the cover creation process, this time diving further into the past and looking back at one of my covers for The Batman Strikes, specifically issue #13. It’s an interesting case study as a lot of things went wrong with this one. As usual, we start with sketches inspired by the story for the issue. I knew that the story involved Catwoman and Batman working together against a common enemy, so I thought it would be fun to treat Batman and Catwoman as a Dynamic Duo, especially since Robin and Batgirl had yet to be introduced into this animated TV show continuity. 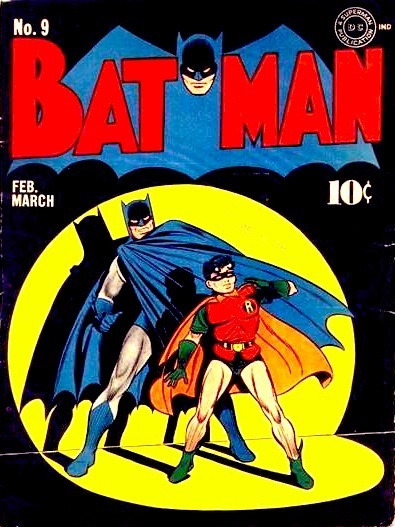 Sketch A was the most literal expression of this “Dynamic Duo” idea, deliberately evoking the classic cover to Batman #9 from 1942 (seen above). Sketch B was a more original design, with a leaping Batman and Catwoman with some nice underlighting and casting shadows on Batman’s cape. These sketches were drawn in marker and then I added the logo and some gray tones in Photoshop to better indicate what the finished cover would look like. As usual, I’m also trying to allow space for the UPC Code box and the cover text blurb I know will be added. You’ll notice that the masthead says #9 – that’s simply the issue I scanned to grab those cover elements for my layouts. Sketch C had Catwoman essentially taking over the book, not only appearing solo on the cover, but with her name plastered over Batman’s in the book’s logo. I didn’t think it was likely this one was gonna fly, but I love covers that play with the logo in some way, so I thought it was worth suggesting. Finally (or so I thought), Sketch D features Batman and Catwoman framed by the shadow of the monsterous true villain of the story. Usually four cover ideas are plenty – either one of those is chosen as is, or often an editor will want to modify an idea or combine elements from two of them, leading to the final design. Not this time. The editor informed me that they wanted to have Catwoman and Batman in a confrontational posture, so none of the ideas I’d submitted were going to work at all. I thought it made more sense to play up the unique dynamic from the story rather than a more generic situation that could be applied to any other Catwoman appearance, but that’s the nature of commercial art – you’re hired for your ideas and your skills but the decisions are up to the client. So I got to do a whole second wave of sketches! At this point I was wanting to deliver sketch ideas that were conceptually pretty generic but still visually interesting. Sketch E has Batman and Catwoman facing off on a ledge while surrounded by cats. I thought this design had some nice depth and the cats added some interest. Sketch F featured a leaping Batman and Catwoman, but surrounded by Batman’s curling cape. 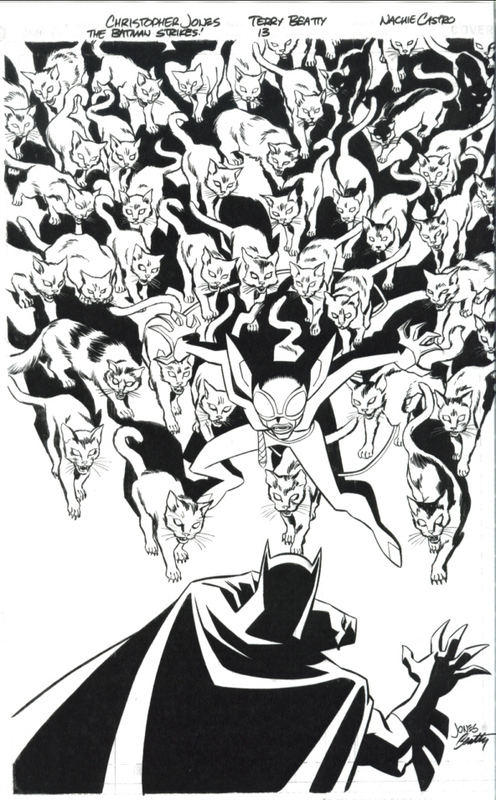 Sketch G had an angry Catwoman and an army of cats facing off against Batman, and Sketch H had Batman and Catwoman simply on a rooftop, using the curling shape of Catwoman’s whip and still more cats to add visual interest again. After all that, Sketch G was chosen, so it was time to draw some cats! I drew Catwoman to be snarling in a threatening manner. It’s always hard to keep women’s faces from looking unattractive with expressions like this, especially in a small drawing. It was further complicated here by the fact that Catwoman’s mask design included goggles that concealed her eyes, so you only have the mouth to convey expression. The expression was a little rough in the pencils, and I think was a little harsher after being inked (inks by Terry Beatty as usual for The Batman Strikes). I was rarely happy with the color on The Batman Strikes. Batman was never colored on-model for the animation design, which used a deep, rich blue for the highlights on the black parts of Batman’s costume. For some reason in the comic based on the art for that show, Batman was always colored in grays, with little contrast between the highlighting on the black parts and the tones used for the gray bodysuit. I always thought the result was drab and tended to flatten out the figure. 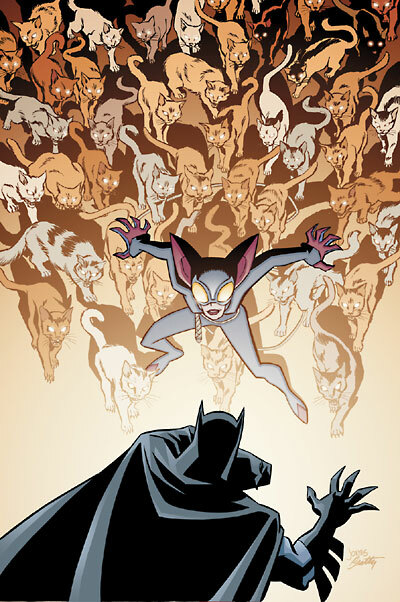 The colorist chose to interpret the lighting scheme of the line art by coloring the cats in different flat colors, and then overlay a glowing lighting effect over everying behind the Batman figure in the foreground. I find the effect rather washed out and flat, and it looks like the cats are fading away like ghosts. Most interestingly, Catwoman’s mouth has been redrawn, without input from Terry Beatty or myself. The snarl has been replaced with a smile, which I imagine was consedered “prettier”, but I consider the redrawn mouth to look a bit crude and I’d have liked to have been consulted on the change. Finally, here’s the published cover with the typical masthead, UPC Code and cover blurb. The colors appear a bit darker – some of which might be the result of scanning – but I suspect the brightness and contrast have been tweaked since the previous “clean” image which was used for the solicitation of the issue to retailers. Well there you have it! Another cover breakdown. I’ll be doing more of these as well as some interior art analysis in the weeks to come! Until then, you can check out more of my cover art for The Batman Strikes – concept sketches, pencils, and finished covers – here! Remember that time that the Penguin kidnapped Cal Ripken Jr? And he had to escape from a giant bird cage using a huge wad of Big League Chew? No? Well you MISSED OUT! But you can still see the art – including a step-by-step breakdown of pencil art, inks and colors! The Batman Strikes! | Christopher Jones | September 25, 2011 1:00 am | Comments Off on Batman meets… Cal Ripken?